Wait, you didn’t know I was going to Rhinebeck? I realized today that I think I managed to leave that little fact off of the blog. I’m SO excited, I just haven’t really had time to be excited for long with busy times here. I bet you didn’t know I had a sweater on the needles to be finished in time for Rhinebeck either. You are correct. I am working to finish the Cutaway Cardigan for Rhinebeck that has been languishing in the bottom of my closet for 9 months. I started the pieces last August and stopped working on it in January. I was nervous about the finishing, so I just stuck it in the closet and forgot about it. Last week, I remembered it and decided it was time for me to face the finishing (which included blocking it on my very highspeed blocking board, a beach towel). 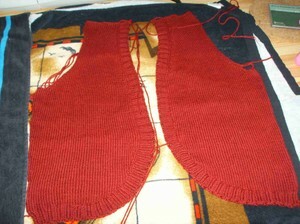 I have been seaming (with a bit of re-seaming) since then. I think I will actually be proud of the finishing on this garment. I have tried it on along the way to see how the seams drape and I’ve not been afraid to tear it out when it looks bad. Look for me in a Cutaway Cardigan at Rhinebeck if not before then because I’m on the last seam tonight! The cardi looks great — beautiful color! And that’s fabulous that you are going to Rhinebeck — me too!! And that sweater looks amazing. I can’t wait to meet you face to face! Yay! It’s finally here!I’m feverishly knitting on a shawl that I want to wear on Saturday…why do we procrastinate?! wooohooo. looking forward to seeing you again!! I am so sorry I will miss you at Rhinebeck – no travel for me at this time. Have so much fun!